If it seems like all I eat these days is sandwiches, pasta, and baked beans, well…you’re probably right. Although I have a host of excuses, I can really explain the bean thing. See, my mom gave me the world’s most amazing cast iron dutch oven. It’s beautiful. And black. And shiny with oil. And begging to have 800 gazillion recipes of beans baked in it. And cobblers. And casseroles. And whatever else you’re supposed to make in a dutch oven (what are you supposed to make in a dutch oven??). Also, apparently, my grandfather (on my mom’s side) was addicted to baked beans. He used to make himself a big pot of beans every week, and his recipe didn’t call for the canned beans. No sireee, he soaked dry beans and threw together seasonings and onions and whatever else he baked his beans in and made him a nice, homemade batch. My gastronome bone goes way back. This is also the grandfather that asked my mom to bake him a pie a day, which she pretty much always did. A pie a day! He was also ridiculously thin. That gene I wish I’d inherited. So without further ado, I bring you baked bean recipe #2. Honestly, I overdid it on the chipotles. The beans are a little hard to swallow. So I’ve toned the recipe down to what I believe would have been a sane amount of peppers. I really like it. 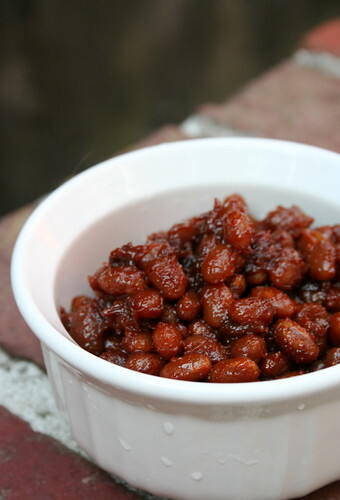 I adapted it from a recipe that called for pre-cooked, canned beans, so I had to add a lot of water to the beans to get them soft, but all in all, it’s extremely straightforward and, again, another great summer cook out side dish! In a cast iron dutch oven, or in a large pot, bring all ingredients to a boil. If using a the dutch oven, after the beans come to a boil, place the lid on the dutch oven and transfer immediately to the oven. If using a pot, transfer the beans to a large casserole (9×13) dish, cover with a lid or aluminum foil. Bake for 1 hour. After 1 hour, remove the lid/covering, stir, and bake for another 2 hours. Add water as necessary to ensure the beans are tender. Once the beans are tender, remove from the oven, let cool, and serve! The pie-a-day diet, eh? I have never heard of that one, but I’ll sign up. Those chipotle baked beans look out of sight. Thanks for sharing the recipe. i too have overdone it with chipotle peppers before – it’s so easy to do, as they pack a lot of heat! sandwiches, pasta, and baked beans all sound gloriously good to me! too funny on your grandfather & his love for beans! even more awesome that he made ‘em from dried beans. we do the same – & love ‘em more than canned. did you say he’d have pie every day, too?!? oh, my life would be so wonderful…..mmmmmmmmm! thanks for the recipe, Jes – another one for us to make & enjoy! woop! ohman, I LOVE baked beans! Maybe with a side of toast and tofu scramble? When I was a kid, we’d have baked beans, eggs, and toast when money was tight. Baked beans are a total comfort food. I love baked beans and my cast iron Dutch oven…I’m definitely making this soon! I have overdone it with chipotles several times. I did it with soup once. It came out so spicy that my mouth was numb! I love baked beans, especially because you can make huge batches of them and have leftovers! OMG yours looks soooo good. i think that food preferences are definitely hereditary. also it’s nice to honor your family history with a nice recipe like this. can’t wait to see what else you cook up in your dutch oven, even if it’s more beans! I feel as if every time I comment here, I’m like “oh how did you know exactly what was in my fridge/life/etc”..and this one is eerily on track. My family is selling our lake camp that’s been in our family for like, 60 something years and we’ve been cleaning it out. So I get to inherit Grandpa’s beanpot. One of those old Boston baked bean crocks for the oven, brown on the top, creamy colored on the bottom. I’m thrilled about this. And I’ve been thinking this week, I want to make grandpa’s baked beans but don’t have the recipe. And then I read your post and was floored that you were thinking about your grandpa and baked beans too! *cue Twilight Zone music* Great post..I will be trying this in Grandpa’s bean crock! Never apologize for beans! They are so nutritious and should be eaten every day, especially if they are as beautiful as yours. Ahh Jes! Did I tell you I totally had a baked bean catastrophe?? And I was so sad because yours looked so good… guess there’s not bean mojo in my dna… boo… does this not work without a dutch oven because my casserole pans were disastrous?? Sounds awesomely delicious! I just burned a batch – in the slow-cooker no less. T. points out: the slow-cooker is huge, and not made for slow-cooking a single cup of beans, overnight, on high. Sigh. Hahaha touche, Jes. Touche. I didn’t even catch that one. Seriously, though…I let “I’m writing” be an excuse for all kinds of excessive, mildly self-destructive behaviors. I know exactly what you mean.